Today, roughly 20 percent of the district’s 10,000 students are English-language learners, many of them with ties to the East African nation of Somalia. The United States is now home to the largest number of foreign-born black people in its history—and many are K-12 students enrolled in public schools. The English-learners among them are overwhelmingly native Spanish, French, or Haitian Creole speakers, but districts have had to adjust on the fly to meet the needs of students who arrive communicating in less frequently spoken languages such as Amharic, Haitian Creole and Somali. Somali families began resettling here in large numbers at the turn of the century, and their children have become fixtures in St. Cloud’s schools. 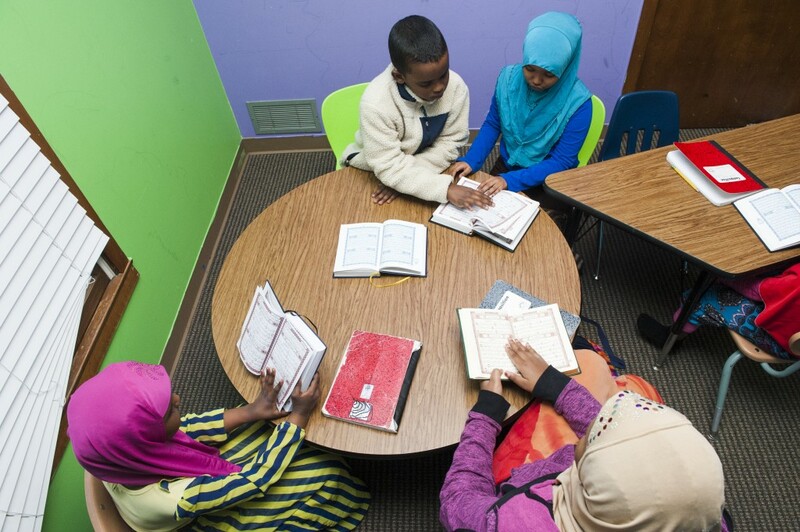 About 1,625 of the district’s English-learners are Somali. And as educators in the St. Cloud district have found, language is often just the first hurdle they encounter when new immigrant communities arrive. The Hassan brothers are on the front lines of St. Cloud’s efforts to better serve its ever-expanding English-learner population and integrate the Somali community. They officially work as bilingual communication support specialists. Their duties range from providing verbal and written translations into Somali and English, advising students, cultural navigation and working to bridge the language and cultural gaps that emerge between district staff members and Somali families. “We’re in between two stones when it comes to bridging that gap between the communities we serve and the institutions we work for,” Ahmed Hassan said. One day, the brothers are explaining to parents that all of their children, including those who have disabilities, have the right to a public education. The next, they’re helping colleagues understand that Somali students who don’t make eye contact aren’t being disrespectful; in their culture, children are expected to look down when adults speak to them. Sundis Ibrahim, 15, arrived in Minnesota two years ago from a Kenyan refugee camp, knowing little English. She’s a sophomore here at Apollo High School, where nearly a quarter of the 1,400 students are Somali. “I understand the questions, but I don’t always know the answers,” Sundis said. Natalie Prasch, St. Cloud’s director of English-learner programs, recruited the Hassan brothers, at separate times, when they came to the district’s Welcome Center to enroll their younger siblings in school. “He was my counselor, my adviser of what to do and where to go when it comes to being successful in this country,” Ahmed Hassan said. Those populations intersect in St. Cloud, where Somali students who spent their entire lives in the desert and tropical climates of Africa must adjust to Minnesota’s brutal winters. “We’re taking kids who grew up in the desert and sticking them in iceboxes,” Prasch said. During the winter months, the district is often tracking down coats, hats, and gloves for students at the same time they’re administering home-language surveys—a set of questions used to identify the language or languages an ELL student speaks and understands. Some students suffer from malnutrition and its mental and physical aftereffects. Those children often hoard food in their lockers because they’re so used to going without. Teachers and Somali staff members alike say the students who’ve had little to no experience with schooling are easy to spot. To address their needs initially, more time is spent focusing on structure and order than curriculum and learning English. In its high schools, St. Cloud has “English Academy” courses designed to aid newcomer English-learners and struggling long-term ELLs get up to speed while teaching core subjects such as biology and math. Counselors also work to integrate students in English-only courses to help their language development. Almost all the courses have Somali-speaking paraprofessionals ready to translate and address student questions. Despite recognition from the U.S. Department of Education for its efforts to educate ELLs, the district hasn’t been able to close a yawning achievement gap between English-learners and native English speakers—a problem that vexes most school systems. Talahi Elementary, where roughly 45 percent of students are Somali, is a state “priority school,” a label attached to Minnesota’s most persistently low-performing Title I schools. With test scores among the bottom 5 percent in the state, the state department of education is closely monitoring Talahi’s performance and turnaround plans. In St. Cloud’s middle and high schools, the district allows prayer time for students, including Muslim students, as federal law requires. The rooms used for prayer are open to all students to observe their beliefs and are used for other purposes throughout the school day. Districtwide, school lunch menus provide pork-free options for students, and staff members try to spur the newcomer students’ interest in sports, culture clubs, and other extracurricular activities to develop connections beyond the classroom. St. Cloud’s Technical High School, the site of Somali student protests last spring over anti-Muslim harassment, began an international club that allows English-learner students to showcase their cultural heritage. But the agreement didn’t signal an end to the resentment and clashes in the district. The post roiled St. Cloud’s tight-knit Somali community. The ensuing unrest drew the attention of Minnesota Gov. Mark Dayton, who attended community forums in the city. Several of the Hassan brothers’ younger siblings graduated from Tech High, the site of the mass walkout last spring. As employees, they wonder if enough efforts have been made to hire Somali teachers and administrators. Finding and attracting Somali-speaking teaching candidates has proved challenging. Only one of the district’s 700-plus teachers is Somali. Not many of the district’s teachers are black. Bishar Hassan, who is a semester away from earning his bachelor’s degree at St. Cloud State, couldn’t peel away from his job in the district to be a full-time student. He and his brother felt duty-bound to support his family and the city’s Somali community.